A big part of organizing any space is knowing what to store there and what not to store there. This is especially true for kitchen counters which tend to become cluttered and disorganized easily. Canisters. Canisters (small and large) are a decorative way to store and contain small items. You can use them to contain grab-and-go snacks, napkins, and other small odds and ends to keep your counters from becoming cluttered. Coffee maker. If you make coffee everyday, there's really no better place to store it then where you use it: on your kitchen counter. The best option to to set up a coffee zone. This means gathering everything that you use to make coffee and, storing above and below the counter where you coffee maker sits. Include: mugs, to-go cups (if you use them), coffee and coffee filters. Dish rack. A must if you don’t have a dishwasher, a maybe if you do. We say “maybe” because you may only run your dishwasher a few times a week and opt to do your daily dishes by hand. Mixer. There are very few drawers or cabinets that can store a large appliance like your mixer, and the size and weight may even damage your cabinets. Keep your mixer on the counter. Paper towels. These need to be handy but not in the way. You want to be able to grab them when you need them, but it’s a pain to have to move a paper towel holder around. Keep it in a very easy-to-reach spot near the sink. Tools (contained in a crock). We keep a crock right next to my stove with spatulas, spoons, ladles, and tongs. It’s handy to have these right within easy reach when you’re working with food on or in the stove, and you can DIY a crock that fits the decor in your kitchen by using a vase, a ball jar, or a even a planter. Salt and pepper shakers. Since you’re going to use these all the time, it makes sense to keep these handy. Veggie/fruit basket. Many fruits and vegetable can’t be refrigerated and you’re more likely to eat them if you can see them right there on the countertop. Plus, fruits and veggies look nice. Cookbooks. Move cookbooks onto a shelf when possible. This way you won’t have to move them to wipe down the countertops and they won’t become dirty when you’re cooking. 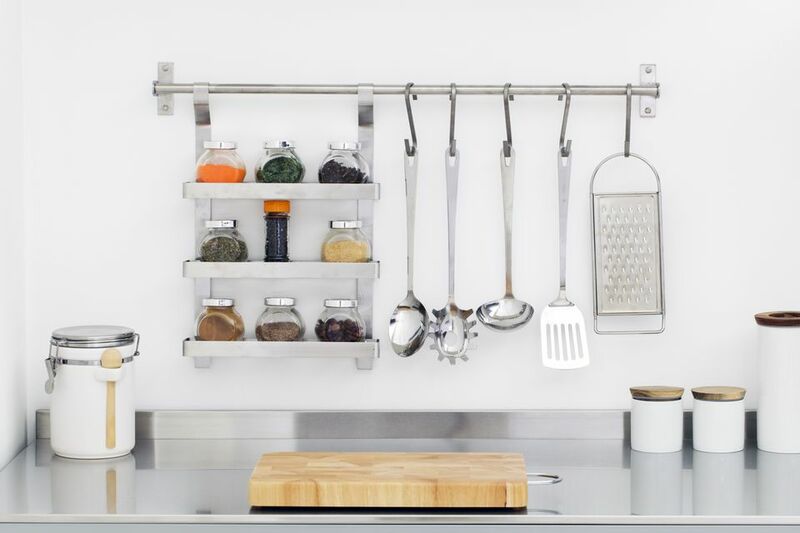 When you’re cooking, protect your cookbooks with this cookbook holder, or this sleek stainless steel one. Cutting board. We love those big cutting boards people leave on their counters. We don’t have space for it, but if you do and you do a lot of chopping, then this is a great thing to keep on your counter. Toaster oven. If you make toast daily, then go ahead and store this on top of your counter. Appliances you rarely use. If you don’t use it every day, get it off the countertop. We like to store appliances we use only once or twice a year in a project bin. Collections. Teacups, figurines, photographs: Mount these on the wall. Papers. If you promise to store them in some type of message center contraption--preferably on the wall above the counter, then you can store a limited amount of papers here. Just don’t let this become a dumping ground for papers you are not sure what to do with. Serving pieces. Store these--unless you entertain daily they’ll be taking up more room than is necessary. Another option is to mount serving platters on the wall as decor.